Here are a few scrapbook pages that I did at a Kids Craft Program using retired stamp sets but current cardstock and colors. The kids had a lot of fun making them - stamping and coloring in all the summer images - as well as creating their own using Stampin' Up! markers. 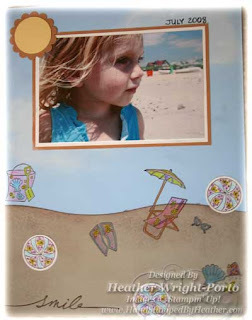 These pages feature my little Michaela and our day at the beach. She loves the beach. I love her little walk with her elbows up and swinging (LOL)! Love the colors and the layout. Really lovely lay out, love how you have used the stamps.